There is no medical cure for Dengue Fever. Blood platelet count abnormally decreases (below 10) when a person is affected by Dengue. The normal blood platelet count is 150. The under mentioned medicine is found very effective for increasing the blood platelet count. 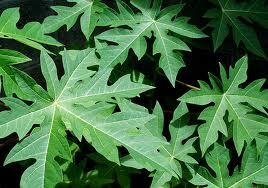 Drinking papaya leaf extract helps to bring up the blood platelet count. Take two pieces fresh papaya leaves (use only the leafy part, remove the stalks), wash it and squeeze out the juice. That should yield approximately 2 tablespoons of bitter juice. Do not boil or dilute with water. Drink the juice as it is. One serving per day is recommended. Within a couple of days, platelet count increases to normal level. 0 Response to "Papaya Leaf Juice: Natural Medicine for Dengue Fever"